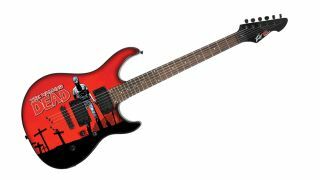 NAMM 2013: Peavey has announced a new range of products featuring graphics from the enormously popular zombie slaughter-fest The Walking Dead. The range will include guitars, straps and picks which will be branded with artwork by Charlie Adlard, the comic artist behind Robert Kirkman's phenomenally successful comic series which provided the source material for the smash hit AMC TV series. Peavey Electronics®, one of the world's largest manufacturers and suppliers of musical instruments and professional sound equipment, proudly announces the expansion of its licensed product line with the addition of products featuring graphics from The Walking Dead, the award-winning comic and TV show. Designed for serious collectors and musicians alike, these new musical instruments will feature highly detailed artwork on guitars and accessories. "We are very pleased to be working with Skybound, the creators of The Walking Dead," commented Hartley Peavey, founder and CEO of Peavey Electronics. "The immense popularity of The Walking Dead comic and cable TV show will allow us to get our products in the hands of an entirely new market and will expand our range of designs." Shawn Kirkham, Director of Business Development at Skybound Entertainment, added, "The merging of The Walking Dead's iconic art and the equally iconic Peavey brand is a no-brainer. I'm excited to see fans and musicians strapping on guitars featuring gruesome Walking Dead artwork from Charlie Adlard. These guitars, straps and picks are going to look brutal!" Peavey's The Walking Dead musical instruments and accessories will be available in 2013 at specialty and major national retailers.